Comprising all the components for bone-borne restorations, Dental Endosseous Implant Systems are the state of the art when it comes to replacing missing teeth and securing full and partial dentures. There are a wide range of implant types as well as systems for placing implants and attaching restorations to them after placement. 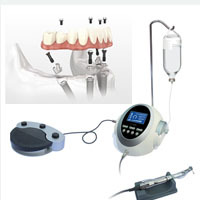 In this section you will find dental implant systems, dental implant drivers, implant abutment systems, implant drilling guide systems as well as implant surgical guide systems, orthodontic micro screw anchorage systems, and orthodontic miniplate/mini implant anchorage systems.